For Transportation and Parking information, please scroll below the following schedule. WATER BOTTLES? To reduce waste (keep’n it lean), we encourage all attendees to bring along your favorite reusable water bottle and coffee mugs. Thank you in advance! Close-in parking is limited so we recommend public transportation, carpooling, or bicycling if you can. You are welcome to park your bike inside the building (enter on the East side with bikes). There are several parking spots near SellerEngine that are free all day Saturday, but pay close attention to signage because most spots are 2-hours without passes. 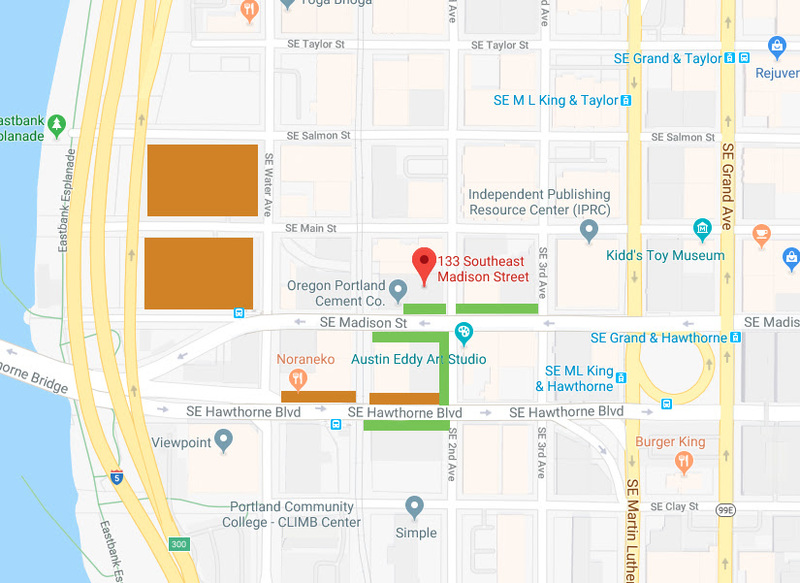 This map shows two-hour parking in green and paid parking in orange. The free spots are under both the East and West bound lanes of the Hawthorne bridge. We recommend removing all valuables from your car.